We are in the middle of elections to five state Assemblies, whose outcome will be no less than a landmark in our political life. Undue notice may not have been taken of these polls if the ruling BJP were not seen to be on trial in three of the five states. These three have been the BJP’s comfort zone for long, and in recent years have been turned into a Hindutva playground, showcasing — along with Uttar Pradesh and Gujarat — the party’s understanding of the so-called Hindu way of life and of rule by Hindus (rather than by elected citizens whose religious identity is not underlined), while giving no more than a formal nod to the Constitution, a remarkable document which emphasises pluralism for a country of bewildering diversity. These particular states are a microcosm of Prime Minister Narendra Modi and his party’s conception of Bharat. Naturally then, as regards these elections, there is also a deep national curiosity — and for many anxiety — about whether the Congress, the country’s oldest party with a very different register of politics and ideology from the BJP’s, can present itself as an adequate challenger to the BJP’s approach to politics and life, and appear as a substitute for it in the public eye. Outright wins and losses in Rajasthan, Madhya Pradesh and Chhattisgarh will of course be a leading marker of the direction public life takes as we look ahead. But clear victories/defeats are not an essential requirement. Even if the BJP or the Congress do not lose emphatically, which means one of them remains a somewhat equal force even in defeat, the prospect of a continuing contest between two distinct brands of politics will remain alive in the future. This will matter early next year when the country will be thrown into the whirlwind of preparations for the 2019 Lok Sabha election. There the canvas will be the whole country and the results will provide a clearer idea of the kind of country Indians want. Do we as a nation seek the same kind of politics as we did in 2014 in the sense of giving the saffron party a no-holds-barred control of our polity and the governing structures, unlike, say, in the time of Atal Behari Vajpayee, when the BJP had to remain content with being constrained by its secular allies? Alongside this had come the overthrow of the Congress lock, stock and barrel — indicating that the country felt the need to try out a different party on a full sway basis (as was the case up to the 1970s with the Congress). Fatigue with the Congress was evident as was evident the urge and temptation to try out the Modi brand of leader, not just the saffron party. Messrs Modi and Amit Shah naturally took this to be a deep-going endorsement of their leadership and long-term commitment to the saffron party by the people of India. The BJP president recently declared that his party was going to rule India for the next 50 years, which some saw as a threat to not relinquish power, leaving no stone unturned to remain in the saddle. But perhaps this was no more than carefree exuberance on the part of the BJP leader. The reality on the ground, as crucial elections approach, cannot however give him and the Prime Minister the comfort they seek from the national mood. After all, no promise of note made in 2014 by Modi to the electorate has been met. The economy is in poor shape. Unemployment is running high. The BJP’s allies have turned uncertain. The Gujarat state election was barely won last year. Karnataka this year was lost. A string of byelections in several states have produced a gloomy verdict. So the party appears to have taken precautions, and pointedly changed direction to overlook the “Sabka saath, sabka vikas” mantra which became such a vote-catcher in 2014, the slogan that was emblematic of the election which brought the BJP to power in a landslide, giving history a turn. For the past couple of months, in the run-up to the crucial state polls and as preparation for next year’s national election, the idea being repeatedly dinned into the public by the BJP, RSS and its militant affiliates, is related to the construction of the proposed Ram temple in Ayodhya, alongside barely camouflaged appeals to violate the recent order of the Supreme Court permitting women of menstrual age to enter the Sabarimala shrine in Kerala. This is surprising for a party holding office. After 1989, when the BJP first began to aggressively raise the question of the Ram Mandir and finally in December 1992 succeeded in demolishing the Babri Masjid, it was the challenger in Indian politics. The Congress hegemony had been dealt a blow by the desertion of V.P. 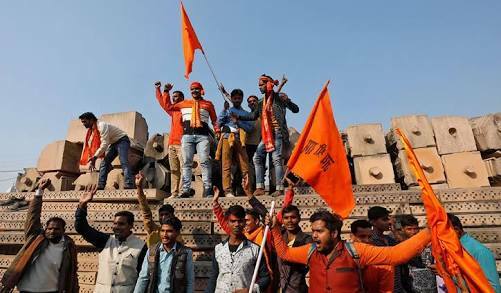 Singh, and the BJP seized the chance to mount its own offensive on the subject of the temple in Ayodhya. This was the BJP’s way to legitimise its communal assault. Much happened in the period before 2014 when Mr Modi rode to power, keeping communalism in the backdrop and front-loading issues of the day-to-day survival of ordinary people in order to attract greater traction as the party that aimed to supplant the Congress as the national icon of politics. But the bid seems to be coming unstuck. Evidently, the BJP never did change its strategic vision. In 2014, it now seems, it had only made a tactical retreat in speaking of the all-round development of all. The saffron party, now as the party in power with the largest parliamentary majority in a quarter century, is obliged to hark back to its slogan of a quarter century ago, throwing caution to the winds. This is a time when it should have been blowing the trumpet on the strength of its achievements. That is not the case, however. Perhaps the ruling party is only too aware of its unwholesome record in office — on the economic and the social front. The clock is being turned back on the political front, with Ayodhya hitting the headlines again. We can’t know what this means for the elections ahead. But it is noticeable that paeans of praise to the political hero of 2014 are muted in the BJP-ruled states going to the polls, with party’s state leaders being highlighted instead in Rajasthan, Madhya Pradesh and Chhattisgarh. Perhaps we are at a cusp in politics.